Pictured above is the St. Joseph North Pier Lighthouse (Lake Michigan) in a seasonal collage. If you haven’t already, you may want to read my other devotion titled Spiritual Winters, which was inspired by this same lighthouse. Do you have a favorite song that brings you close to the throne of God? I have a few, but I was recently brought even closer by a song that was playing in the background while I was praying at the altar a few Sundays ago. The song is titled, I Will Bless The Lord. Please listen to it (below) in its entirety. Tears flowed down from my eyes like a leaking faucet as I reflected on the words of this liturgical melody. I pictured myself as a lighthouse brightly shining in all kinds of weather; A beacon radiating worship and thanksgiving to the Mender of the broken and the Healer of the soul. I began to have flashbacks of the times when I’ve been downcast, deeply discouraged, and in physical/spiritual distress. These flashbacks were quickly followed by vivid memories of times of great joy, encouragement, peace, and abundance. All together they ushered even more tears of gratitude and expressions of praise. I realize that my “bad” days may be nothing compared to what others have experienced or what I am yet to endure. Nevertheless, I have had my share of challenges, doubts, fears, and thoughts of wanting to throw in the towel (as a leader). Yet, during all of these times, an indisputable truth has remained. A reality that has made the difference between victory and defeat has manifested itself unfailingly. And that is that God has been faithfully by my side through it all. That is why, as the song says, I join all creation and glorify His holy name! As I sit here writing this post, I am reminded of one of my favorite fellow bloggers. She is one of the very few people I know who truly shines like a lighthouse in all seasons. 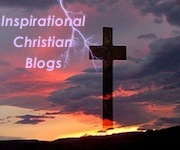 Her faith is evident in the life stories she shares on her blog The Silver Lining. Take a minute to read some of them and see how Angela sees a hopeful side in every situation. When you truly love, follow, and serve Jesus you shine the light of His salvation in a world filled with spiritual darkness. 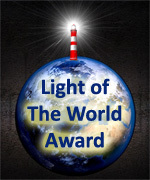 That is why I consider every believer to be a lighthouse for God. And if you know a thing or two about lighthouses, you know that they serve as guides and markers in all kinds of weather, especially during dark and stormy days. With that in mind, remember that even though we can and will enjoy many wonderful and rewarding (calm and bright) days in this life, we are not exempt from experiencing difficult (stormy and dark) ones as well. Contrary to what some “Gospel” preachers may proclaim today, knowing and serving God is not about being well-to-do or living trouble free. It’s not about avoiding every curved ball, pothole, or hurdle in life. And it’s definitely not about satisfying our wants. In other words, it’s not about us. It’s about living with the joy, peace, and assurance of God in the midst of a morally declining world; A world filled with many trials and temptations. It’s about what Jesus did for us 2,000 years ago on a hill called Golgotha. It’s about His love, His faithfulness, His mercy, and His grace. In other words, it’s all about Him and who He is. He is The Maker of the heavens, the oceans, and the skies. He is the One who knitted us in the womb of our mothers and created us for His glory. He is the One who promised to never leave us or forsake us and that is why we ought to bless him at all times! Prayer: Father of creation, truly the heavens declare your glory! In the midst of all the challenges I face, I see your faithfulness, your mercy, and your tender love extended towards me. I praise you simply because of who you are and because I am a recipient of your grace (unmerited favor). Help me to remain strong in you and to keep shining your light no matter what life may bring. May your praises be continuously on my lips. Yes Joe, it’s all about Jesus! Thanks also for sharing the exquisite song of praise! And thank you, Kathleen, for taking the time to read my post. May we never lose focus on why we are. We are to bless (shine for) Him at all times because it truly is all about Him. Thank you for shining His light! Terrifically expressed in gratitude to Him who is worthy of our praise. The lyrics to the song kept my focus on your joy of praise while reading your words. Thanks as always, Joe.